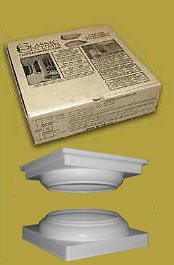 Classic columns appear larger than typical tapered columns as they are not tapered and are full nominal sizes. - Our 6” is a full 6 1/2” top to bottom and has the appearance of a tapered 8” which is about 6 1/2” at the top tapering to 7 1/2;” at the bottom. - Our 8” is a full 8 5/8” top to bottom and has the appearance of a tapered 10” which is about 8 1/4” at the top tapering to 9 1/2” at the bottom. - Our 10" is a full 10 3/4" top to bottom and has the appearance of a tapered 12” which is about 10 1/4” at the top tapering to 11 1/2” at the bottom. - Our 12" is a full 12 3/4" top to bottom and has the appearance of a tapered 14” which is about 12 1/4” at the top tapering to 13 1/2” at the bottom. Important Notes: · IPS sets are for use with IPS water pipe which can be purchased from your local waterworks supply house. · SDR sets are for use with SDR water pipe which can be purchased from your local waterworks supply house.